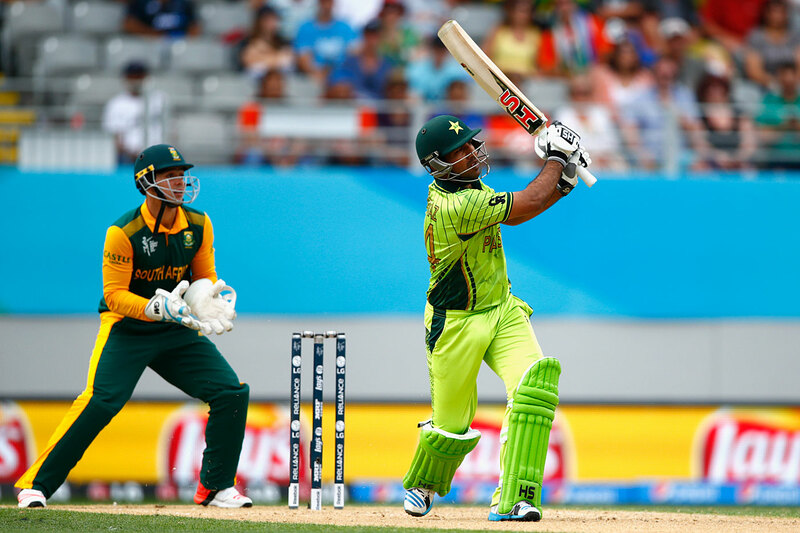 On March 7, 2015, Pakistan met South Africa in a must-win match at the World Cup. They decided to open with Sarfraz Ahmed. Until then in the tournament, Sarfraz had sat warming the bench - to much criticism - as Pakistan chose to play Umar Akmal as a makeshift wicketkeeper in a bid to bolster the batting. The management had little faith in Sarfraz's batting, especially as an opener, though he had had previous success in the position. Here he was sent to open against the best bowling attack the team had faced so far. He was beaten inside the line by Dale Steyn the very first ball he faced. "The way I was beaten, it gave me an idea," Sarfraz told me when we met in Karachi a few weeks after the World Cup. "Unless I move forward to meet [the next ball], this gig is going to be up, as the pitch was difficult and the conditions were overcast. So I understood that even if he bowls a sharp bouncer, I could be proactive, as I was ready for him." Sarfraz started batting out of his crease, shuffling, shifting and sliding effortlessly across it, and eventually scored an entertaining 49. That helped Pakistan to their most authoritative start in the tournament against a major side. For the casual observer, Sarfraz's daring improv style bore some resemblance to the exciting new strain of batting that livened up the tournament; for this Pakistan side it was an anomaly. Like transistor radios in the age of the internet, this team was composed of batsmen suited to an earlier, forgotten era of cricket. In that light, Sarfraz's innings prolonged the lineage of a distinct strain of Pakistani cricketers. This type of batsman isn't unique to Pakistan, but the Pakistanis who fit it are most likely to be from Karachi. Think of Moin Khan and, to some extent, Rashid Latif. Before them, Asif Mujtaba, and well before them Mushtaq Mohammad and Asif Iqbal, and between them the man who fleshed out the prototype himself, Javed Miandad. What they had in common was a non-traditional, lateral approach to finding solutions. They looked to generate new ideas. The question was whether this capacity was in some way linked to the city they all hailed from - was there something about growing up in Karachi that conditioned their response? Perhaps this was romanticism - trying to find a reflection of the city I was born in within the game that I loved. But it seemed relevant that when one thought of, for example, the reverse sweep, the advent of proactive running, or counterintuitive strategies, there was always a someone from Karachi involved. A list of the world's largest cities includes several Test centres in the subcontinent. Some, like Lahore and Delhi, are ancient cities with long and grand histories. Some, like Mumbai or Kolkata, are products of colonialism but with a contiguous link to their older pasts. From having been essentially a fishing village, Karachi was completely transformed by the end of colonialism. So much so that Imran Aslam, a renowned journalist and Karachi resident, says of it: "[It is] a city by the sea [which] has no sea culture, because the entire population here is either Ganga Jamni [from the Gangetic plains of northern India] or from the mountains. You don't get lobsters here, nobody really eats seafood, and you don't see any sailors. It's a city which has no dwellers of its own anymore." The birth of Pakistan turned Karachi not only into the new capital but also the destination of millions of refugees and migrants, who arrived as much for ideology as for survival. The states of northern India were home to many of the Muslim elites who led the movements for the creation of Pakistan. As such, Karachi was seen as the crystallisation of an idea. The explosiveness of the city's growth soon outstripped the state's ability to realise this idea, and in the decades since, endemic violence has crippled it further. Yet it has remained the country's industrial and financial hub as well as its major port. In his book on Karachi, the French author Laurent Gayer describes the city's tense, contradictory equilibrium as an "ordered disorder", and hits at the larger question of Karachi: "How has this city subjected to violent escalation and polarisation… avoided a fully-fledged explosion?" Gayer asks this in the context of the last three decades, when the pervasive levels of violence truly began, but as his book makes clear, the idea of the ordered disorder took root in the city's post-partition development. 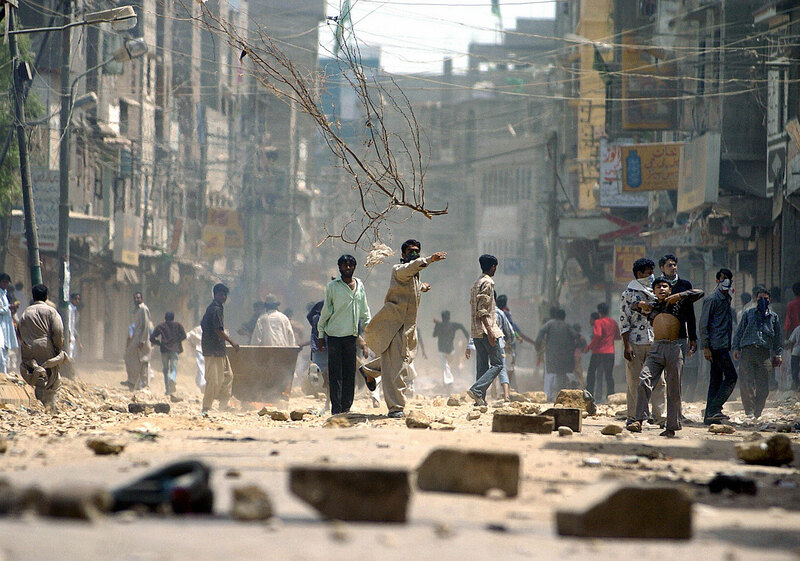 Karachi has always been the most consistently tumultuous city in the country. Over time it has given rise to a specific response from its citizens: "rather than coping with crisis," Gayer writes, "they have learned to cope in crisis". Survival instincts are honed that much sharper here. It manifests itself in a couple of ways. One, as Moin Khan put it to me, is an inner competitiveness. "You are even told at home about the need for healthy competition, and it's very important - if you don't make someone your competitor, then who are you competing with?" It also brings an urgency and practicality to all tasks, as Rashid Latif illustrated to me through an example of two salesmen. "I take a salesman [outside Karachi] and I tell him, go and do this thing and come back. On his way he will go home and his amma will tell him that she has given the daughter's dupatta to the dyers, so could he please pick it up on his way, but when he gets there the dyer says he'll have it by the evening. So now the salesman figures he is hungry and gets something to eat and it will be evening before he returns to you. In Karachi, you tell him, 'Go do this' and he will go, get it done and come back." That was not apparent in the cricket immediately. For the first few decades after 1947, Karachi's main source of quality cricketers was its elite, colonial-era schools. They had access to the best facilities and established traditions, and played eagerly contested tournaments. The schoolboy cricketer, particularly one born to Muhajir (or immigrant, to describe those who moved to Pakistan during and after partition) families looking to establish themselves in a new land, was cast with certain expectations and incumbent responsibilities. The consummate product of the school circuit was Hanif Mohammad, and until the 1970s he represented the ultimate ideal of a Karachi batsman. His 337 in Barbados was testament to a young, determined force that refused to give in. Little wonder then that the country, and particularly those sharing his recent migrant past, saw so much of themselves in that effort. It was an innings defined by grit, as the sunburnt layers of skin on his face from 16 hours at the crease testified. However, things would begin to change for both the city and its cricket. Faced with a constantly restive population that defied the state's directives, Ayub Khan, Pakistan's first military dictator, decided in 1960 to move the capital from Karachi. The city continued to attract economic migrants from across the country, becoming simultaneously wealthier but also more unruly. Its centre gyrated to foreign bands and discos and bars, while its peripheries grew rapidly and informally, with the state too overwhelmed to keep up. It was inevitable that cricket would change, and by the '70s the conditions were in place for a new type of batsman to emerge. Tariq Alam had just completed his matriculation exams in the early '70s when Pakistan's domestic cricket began to induct department sides, such as those of banks, in their first-class set-up. Alam's club had organised a match against a department side where they were set 270-odd to chase and had lost three or four wickets. Keeping with his burgeoning reputation on the local circuit, he walked out and scored a hundred, leading his team to victory. His innings impressed the opponent's sports in-charge, who offered him a spot in the side and a job at the company. Alam was dazed by the offer. "I was in matric then and I didn't know anything about anything. I just looked at him and said, 'What are you saying?'" he told me in Karachi late last year. Some seasoned pros urged him to say yes, and Alam headed home to tell his mother and older brother. He remembers being frightened by the turn of events, but his similarly surprised elders quickly realised that he had been offered a job before he had even got to college, and they decided this was the best way forward. What it meant was that boys from middle-class families could pursue cricket as a serious profession. It meant that playing for clubs could land you a stable job, and in a city driven by the need to survive, it suddenly gave cricket legitimacy in the eyes of a new class of people. While these changes were sweeping through the domestic game, the national team was also changing in decisive ways - both in terms of how it played and how much it was paid. Led by Mushtaq Mohammad, Hanif's younger brother, a new generation of cricketers emerged. They played extensively on the English county circuit, and were attuned to a professional approach to the game and to the competitiveness that came with it. 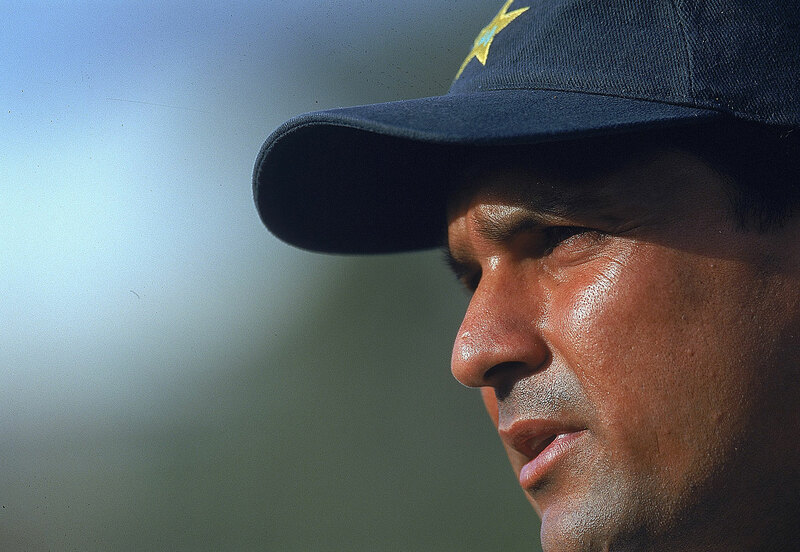 Mushtaq captained a team that provided the template for the modern, unquiet brand of Pakistani cricket - confident, explosive and mercurial. The apogee of this reinvigoration came, fittingly, in Karachi and against India in 1978. The Indian captain, Bishan Singh Bedi, had already watched Pakistan romp to an improbable win chasing at six an over in the final session of the previous Test, in Lahore. In Karachi the target was stiffer. Pakistan needed 164 to win in 100 minutes, and Bedi was taking few chances, banishing almost his entire field to the boundary. The tactic did not faze Imran Khan, who kept going for, and pulling off, big hits near the end. But what made that chase memorable was how two batsmen chose not to defy Bedi's tactics but to use them against him. Promoted by Mushtaq, Asif Iqbal and Miandad put on 97 in nine overs, and they did so by tapping the ball instead of blasting it, and running with an aggression unknown to cricket then. Both batsmen were capable of hitting boundaries, but the decision to go for the smarter choice lit up the imaginations of those watching. A small clip online captures their impish assault, in which they pinched doubles and stole byes off dazed fielders. It was, as Zaheer Abbas would later observe, "one-day running but ahead of its time". But that particular style of batting had already taken root in Karachi's club circuit. Alam, father of Pakistan international Fawad, made quite a name for himself on the club scene - crowds of thousands are said to have flocked to watch club matches in the '70s, and he was often one of the main attractions. An increase in the number of matches exposed players to all sorts of situations, with limited time often requiring a new batting approach. A certain kind of batsman came to be lionised, one now recognised as a prototype of the ODI finisher. "My batting position, in the middle order, is one where when you arrive at the crease the match situation has become apparent," Alam told me. "From there you have to make sure that you complete your turn at the crease. I only regard someone as a batsman [if he] can take the match with him and return having finished it. If you make 30-40 and get out, then those runs are useless for the team." The obvious subtext to this approach was a desire for heroism, but one that only took place as a subset of the team's glory - Alam dismissed those batsmen who play for the "Wah wah" of a few dashing strokes. What was crucial was the ability to take the situation by the scruff of the neck and drag the team to its finish. In Urdu, Alam said "match ko pakar ke chalna", or, to grab hold of the game and go along with it. It was an especially resonant phrase. For example, Moin, whom I met in the sprawling office of his eponymous cricket academy, used a similar phrase to define great batsmen. "Whenever you looked at the great batsmen of the past, it would seem that game ko chala rahe hain khud [they are running the game by themselves], and everything else would be a function of them." For modern fans, venerating finishers isn't out of the ordinary. But where nowadays those runs are scored increasingly in boundaries, this type of batsman would use subtler, less bludgeoning methods. Not that there is less risk in this approach. Risk-taking, as Moin explained, is intrinsic to the Karachi approach. "One who doesn't take a risk is caught between two stools. You have to take a risk for your own success. And when you do take a risk, then your approach is always positive." It is what he did with his running between the wickets, when he felt he had to keep the other team on their toes. "There's a chance in that - sometimes you can make the error, sometimes the fielder will. But until you put pressure on the fielder he won't fumble… and if you're waiting that if he fumbles then only I'll run - no! You have to make him fumble. You know how they say, 'Make it happen'? You have to play with the other's mind." Jugaar is a popular Urdu and Hindi word that Wikipedia defines as an "innovative fix or a simple work-around". A person employing such methods is often referred to as a jugaaroo, which when you think about it really means someone who is good at lateral thinking or at finding solutions that circumvent traditional logic and norms. The rationale behind this piece was that Karachi had a rich tradition of the jugaaroo batsman. The cricketers I spoke to focused very little on the jugaar aspect of batting - they were keen to speak instead about the meaning or purpose of batting rather than the process of it. But the meaning they ascribed to batting also gave away its connection with the approach: they saw themselves as the little guy, the outsider who lacked the privileges that came to others; forever the little guy punching above his weight, goading the opposition and pretending he can bully the bullies, right till he is actually doing so. Imran Aslam had a wonderful quip that perfectly unlocks why the country's largest, richest city would see itself as the little guy or the outsider. Describing the politics - both of cricket and the nation - in Pakistan's two power centres, he says: "When you go to Lahore, they say to you, 'Listen, there's a conspiracy going on against me. You just see, there's a lot of politics going on.' In Karachi, the first conversation is always about injustice." The word ziyaati - injustice - came up, unprompted, in just about every interview, and it reflects the view that those based in Karachi are outside the system, one that will always seek to attack and marginalise them. The ideal response, then, is to fight back using one's own basic resources, and rely on ideas that exist outside of the norms - in essence, the definition of jugaar. "In a sense, all batsmen are doomed. They walk to the crease knowing that their innings is finite, and that it could end at any moment. It takes a very special person to relish that situation, but that's how Javed Miandad played. He had the mentality of a fugitive, content to live on his wits no matter how great the risks. In fact, he needed those risks in order to thrive. The anarchy stimulated him." Yet Miandad also transcended this category because he was far too good a batsman, too blessed with skill and ability to be truly considered just a jugaaroo. By design, this approach comes to those who are not as gifted and must find other ways. Think of the innovation that came naturally to Mushtaq, who lacked at least the technique of Hanif. 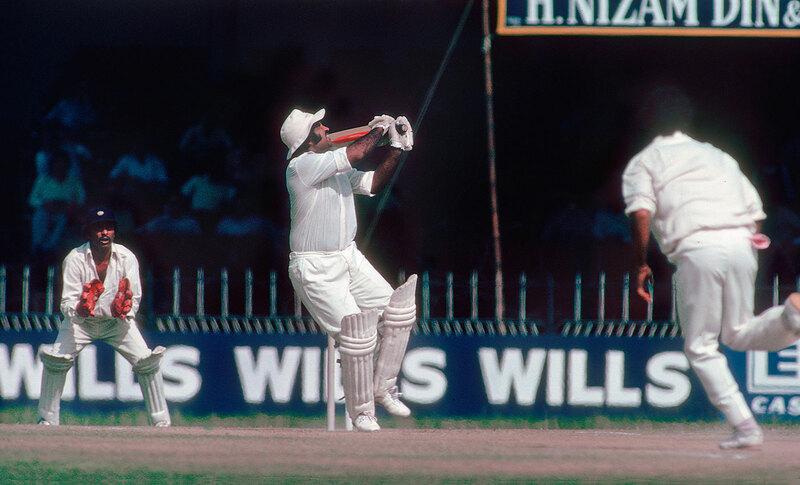 Rather than be daunted, he was creative, experimenting with pinch-hitters like Imran or sending Iqbal to open, and most of all with the reverse sweep, which he lays claim to having invented. That had come in a club game in England in 1964. The problem was Fred Titmus bowling on middle and leg with a midwicket and square leg in place; Mushtaq's solution was to reverse sweep through the vacant point- and third-man region. 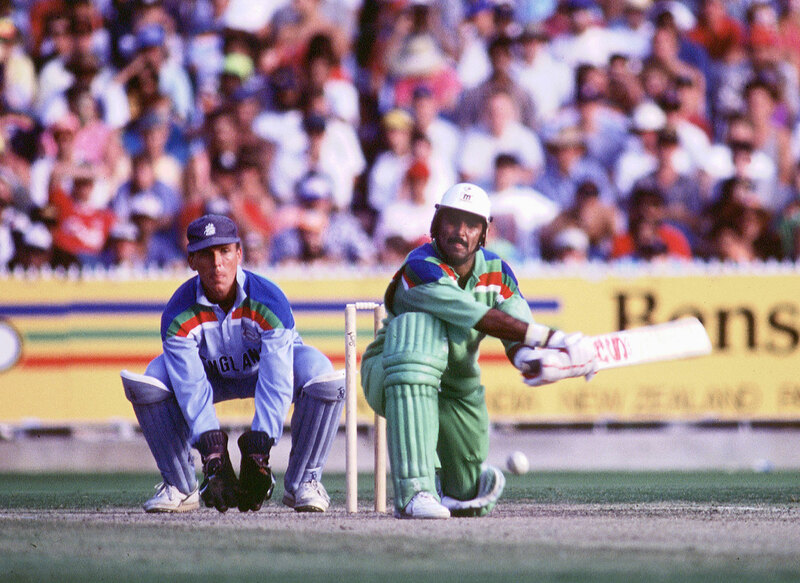 Mushtaq had several classic back-to-the-wall performances in his career. A similar sense of crisis inspired Iqbal as well, who was never seen as a top-order batsman and yet was consistently reliable when it was toughest to bat. Osman Samiuddin calculates in The Unquiet Ones that 18 of Iqbal's 23 scores of 50-plus came "with Pakistan in deep strife". You glimpse it in others from the city too; in Asif Mujtaba's two impossible ODI chases against Australia, sealing a win and a tie with a last-ball six; in Moin's audacious sweeping of Glenn McGrath, a shot he admitted he never dared practise against his own bowlers in the nets; in Sarfraz's heist in Sharjah. None of this is to claim that such players are unique to Karachi, but it is often true that in a sport as traditionalist as cricket, such players often emerge from the hinterlands, from far-flung areas with self-taught techniques. Cricket's great cities on the other hand soon absorb young players into the sport's institutions, rationalising their approaches. If there is anything unique about Karachi, it is that its tumult and sway have created a propensity for throwing up these players. It is difficult to see what the future holds for this sort of player. The opportunities of tape-ball cricket, the city's great love and invention, as well as the techniques it imparts, have affected the ability of local batsmen to adjust to regular hard-ball cricket. One of the links between Rashid's and Moin's era and that of Sarfraz is Shahid Afridi, whose influence on local batting ideals cannot be discounted. More significantly, batting all over the world has undergone a significant evolution, one that Pakistan has missed out on. International cricket is now gone, a further impact on the exposure afforded to local players. Then again, those are exactly the kind of odds against which Karachi batting might thrive.